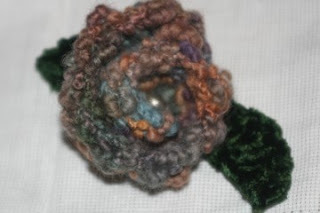 Here is the knit flower I promised yesterday. It was designed by one of our sales reps and uses scraps of Mountain Colors Moguls. For the leaves you are on your own. They are knit with some sort of very soft fuzzy yarn and the designer didn't tell us how she knit them. Perhaps one of Nicky Epstein's books would help. Or leave out the leaves all together. So here is how to knit your very own flower to pin on your winter coat or add to your next knitted hat!! We would love it if you would share photos of your Moguls flowers!! Our email is info@mountaincolors.com for those inclined to share! Yarn: Mountain Colors Moguls....about 1 ounce. Bind off. Decorate with bead and attach a pin back. For a very small flower skip Row 1. Thank you for sharing this pattern...it is just what my hat needed! I am so happy you've started a blog. I am looking forward to seeing photos of yarns and colorways that I just can't live without. I'm so glad to find this blog! I've bought Mountain Colors yarns via Ebay for the past year, and have never worked with such scrumptious yarn! I look forward to seeing more goodies, and trying out more of your patterns.